Actually, all the tourists go to the north part of the island, people don’t really visit the south (I’m not gonna lie, I didn’t go there either). The island is long and narrow, with a width of about 50 kilometers (30 miles). A little bit more than 400000 people live there (more than half of them live in Puerto Princesa, the main city). What to do in Palawan Island? Not much actually, people go there to relax. Oh actually you can go snorkeling, or go on day trips to discover the surrounding islands (we call it island hopping). So I visited Puerto Princesa, Port Barton and El Nido. Planning a trip to Palawan Island? Follow the guide (you’ll find all the info at the end of the article). I started my visit of Palawan Island in its main city, Puerto Princesa. Once again, all the travelers were saying it’s useless to stay there. Indeed there are other things to see in Palawan, but Puerto Princesa is not horrible. I spent a few days there and I didn’t find the time extremely long. The locals were nice, a lot of them were greeting me in the street. As a side note, the Puerto Princesa airport is almost in the city, it’s crazy! I walked from the airport to my hostel, it only took 15 minutes! In Puerto Princesa, you can spend a day walking around in the city, especially in Baywalk Park by the water. You can also visit the museums of the city. The Palawan Heritage Center exhibits work of art of the area, there are exhibitions relating the history of Palawan and its culture. You’ll be with a guide in the center, I don’t really like it… But it’s interesting to see. It’s 50 pesos to get in (less than one euro). There’s also the Palawan Museum (50 pesos as well, I didn’t go), and the World War II Memorial Museum (didn’t go). You can also have a walk in the city and relax in Rizal Park, and if you’re into history, you should go to Plaza Cuartel, just next to the park. It’s an open-air sanctuary, in memory of the American prisoners of war who were burned alive there by the Japanese soldiers on December 14th, 1944. Only 11 soldiers of the 154 survived. Unfortunately Plaza Cuartel isn’t well-maintained. It’s free to get in but you can make a donation. Are you into beer? If so, then you should head to Palawan Brewery. You’ll have the opportunity to taste many local beers. Prices vary from 160 to 250 pesos (from 2.60 to 4.15 euros), and the staff is extremely nice! In the evening, head to the Tiki Bar, this is where people go to have a drink or to have dinner. You’ll have to pay 20 pesos (less than one euro) to get in, but also a 25 pesos (less than one euro) “table fee” because you’re eating at a table… There’s the E Republik next to the Tiki Bar, it’s free to get in, but also Kalui Restaurant a little bit further. Don’t hesitate to go to Baga Baga Puerto Food Hub, they have many stalls, and you can eat good food for a cheap price. Is there anything to see around Puerto Princesa? Yep! Take a full day to visit the islands of the area, all the hotels suggest doing it, just ask them for all the information! So I spent a day on a boat, discovering Honda Bay. You’re basically visiting the surrounding islands, that is to say Starfish Island, Luli Island and Cowrie Island. After lunch, we went to Luli Island, but we only stayed half an hour there. Once the water, the water is extremely clear and wonderful. Our last stop was Cowrie Island, where we stayed a little bit more than two hours. There are a lot of activities there : jet ski, kayaking, scuba diving, paddle… There are also a few bars, and a massage parlor! Really nice! We went back to Puerto Princesa at the end of the day, and I didn’t regret doing this trip at all (more info at the end of the article). In Puerto Princesa, there’s another major tourist attraction called the underground river. From what I heard, you spend the whole day on a boat, and you go through a kind of cave. Many people told me it wasn’t worth it knowing the whole ride to get there, the wait, all the tourists there… So I decided not to go. If you have the opportunity, go visit Iwahig Penal Farm, it’s an outdoor prison (where locals serve theirs sentences). It’s open to the public. After Puerto Princesa, I went towards Port Barton. Port Barton is the place to be if you wanna have some rest and do nothing. Port Barton is very quiet and moreover, you’ll be cut off from the outside world. Indeed, there’s no internet in the village, except in some rare hotels, the most expensive ones. Even in the internet café, where I went several times, they never had internet access. Anyway, no internet doesn’t hurt every now and then! But you need to know one more thing, they don’t have electricity 24/7! Except in some rare hotels, there’s only electricity from 5:30pm to midnight, not during the rest of the day. You need a quick period of adaptation, but it’s always better to know that before getting there! In Port Barton, I met many travelers from Spain (probably due to history ’cause I didn’t meet a lot of Spanish people during my whole trip). You’ll also see many couples, and stray dogs all over the place. Once again, many locals greeted me in the street, it feels good! In Port Barton, apart from relaxing by the water and eat good food, there’s not much to do… So I spent another day on a boat, discovering the surrounding islands. A nice day on a boat in a small group, and we had a lot of fun! 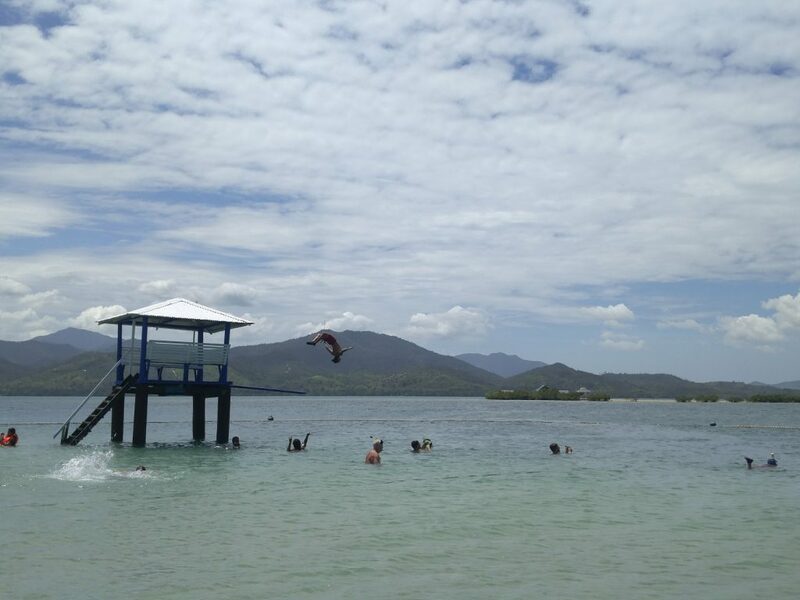 Like Puerto Princesa, we spent the day visiting several islands, go snorkeling, having great food for lunch… We saw clownfishes, starfishes, giant turtles… A very good day, the atmosphere was nice and relaxed. After Port Barton, I went to El Nido, since I heard so much about it. After spending some time in Port Barton, El Nido seems extremely bustling. Indeed, it’s the most popular place in Palawan! Don’t expect to have some peace and quiet, at the water’s edge, with a coconut tree in the background… No no, there are tourists all over the place!!! In El Nido, you’ll mostly find hotels, hostels, restaurants, bars, and tour operators selling tours to see the neighboring islands. By the waterside, the best seats in the bars are quickly taken to admire the sunset. We’re far from the peacefulness of Port Barton, where there was space for everyone. Once again, numerous dogs wander in the street. Enjoy some food outside quietly, and four dogs will come out of nowhere, staring at you, waiting to get some food. Even though El Nido is the most popular place in Palawan, there are still power cuts every now and then. For your information, they only have electricity 24/7 since 2014. What to do in El Nido? I told myself that once again, I’ll spend a day on a day, to see what it’s like there. In Port Barton, I mostly met Spanish people but in El Nido, all the travelers I met were from the UK or from Germany. In Port Barton, we were six on the boat, in El Nido, we were 30 people and it was a lot more expensive (info below). We first went to 7 Commando, where we stayed during 40 minutes. There, it was possible to go snorkeling, have fun in the water, relax… Then we went to Shimizu Island, where we had lunch. After that we went to Big Lagoon, and finally Small Lagoon where the staff kinda forced us to go kayaking (it wasn’t free, but it was nice and we had a lot of fun!). The day on the boat was cool, but we were way too numerous, on the boat and on the different islands! Plus the beach is too crowded in the evening for the sunset! Fortunately, I heard about another nice beach a little bit further called Las Cabanas. I recommend you guys to go there! I also heard about Nacpan Beach but I didn’t go. If you wanna have some peace, those two beaches are perfect! The fact that El Nido is crowded doesn’t mean you have to avoid it, I had a great time there and the landscapes are wonderful. I’m just telling you guys it’s not the best place if you wanna have some peace. After El Nido, I went back to Puerto Princesa, and from there I took a flight to Manila. I strongly recommend you guys to go to Palawan, I loved my stay there. Don’t go to the Philippines without a travel insurance! In Puerto Princesa, during my stay, there was a car accident and a guy passed away. Not far from El Nido, another accident with a truck and a motorbike killed two locals. Again, during my stay, I saw a tricycle accident. Anyway, better safe than sorry! How to go to Palawan? There are cheap flights from Manila to Puerto Princesa, the main Palawan Island airport. How to go to El Nido from Manila? At the hostel, I heard several backpackers ask “How can I get to El Nido?” There are direct flights Manila-El Nido but they’re expensive and there aren’t flights everyday. Take a flight from Manila to Puerto Princesa, and from Puerto Princesa, take a van to go to El Nido. When to visit Palawan Island? From December to April. It’s not too hot, and it’s not raining! What’s the first thing to settle in Palawan? Money! In Puerto Princesa there’s no problem but in Port Barton, there’s no ATM. You need to bring enough cash! In El Nido, the first ATMs “arrived” in 2016! And all the travelers get their money there! If you wanna withdraw money, do it in the morning! At 4pm, it’s too late, all the ATMs are empty! Find cheap accommodation in Puerto Princesa, Port Barton and El Nido. In Puerto Princesa, if you wanna spend the day on the boat to see the underground river, you’ll have to pay 1800 pesos (30 euros). For the Honda Bay trip, I paid 1300 pesos (21.50€), lunch included. From Puerto Princesa to Port Barton, I paid 450 pesos (7.50€) the ride by van, it lasted three hours and a half. Before getting there, you’ll have to pay an environmental fee, it’s 50 pesos (less than one euro). They’ll give you an “eco card”. Don’t lose it, you’ll need it to do the day trip on the boat! In Port Barton, I paid 700 pesos (11.50€) the day trip on the boat, lunch and snorkeling included. Be careful, in White Beach, there are jellyfishes! I paid 600 pesos (10 euros) my ride from Port Barton to El Nido, it was a 3-hours ride by van. Everywhere in El Nido, they propose the same tours for the day trips on the boat (tour A, B, C or D). I picked tour A and paid 1200 pesos (20 euros). The snorkeling equipment is not included, you’ll have to pay an extra 100 pesos (1.80€). You also have to pay for the kayaking. It’s 400 pesos (6.50€) the two-people kayak, and 700 pesos (11.50€) the four-people kayak. But the lunch is included in the tour. During the day on the boat in El Nido, we went to Big Lagoon. Be careful, there are jellyfishes. Someone in another boat got stung by one! In El Nido, it’s 500 pesos (8.30€) per day to rent a scooter. Perfect to explore the surroundings. For your information, in San Vicente (another Palawan city not far from Port Barton), the locals often organize cockfights. If you wanna buy a local SIM card, get a Globe SIM card (not a Smart SIM card). There’s no service with a Smart SIM card, but no problem at all with a Globe one. The travelers’ diarrhea is very present in Palawan, be careful! From what I heard, malaria as well is there! That’s why it’s important to get a travel insurance! I paid 500 pesos (8.30€) my ride from El Nido to Puerto Princesa. Palawan is an amazing island. I went there years ago but I didn’t have time to visit Porto Princessa. I spent time in El nido after travelling by boat from Coron. I went to Palwan over 10 years ago and loved it! Seems like it’s gotten more touristy since then but still beautiful. Yeah it’s really beautiful, and indeed quite touristy now! Palawan is a world class place. People have to go visit Palawan and experience it’s beauty. Really enjoyed reading this post! Inspired me to add Palawan to my bucketlist! Thanks for sharing!